Availability of option for fixation of pay on promotion from the Date of Next Increment (DNI) in the lower post and method of fixation of pay from DNI, if opted for, in context of CCS (RP) Rules, 2016-regarding. Subject: Availability of option for fixation of pay on promotion from the Date of NextIncrement (DNI) in the lower post and method of fixation of pay from DNI, ifopted for, in context of CCS (RP) Rules, 2016-regarding. Prior to implementation of 6th CPC Report, the pay fixation on promotion was governed by provisions of FR 22(I)(a)(1). In 6th CPC context, the first part of FR 22(I)(a)(1) was replaced by Rule 13 of CCS (RP) Rules, 2008. Similarly, consequent upon implementation of CCS (RP) Rules, 2016 in 7th CPC context, the pay fixation on promotion is regulated by the provisions of Rule 13 of CCS (RP) Rules, 2016. This rule regulates pay fixation on promotion if the same is opted by the employee from the date of promotion itself. 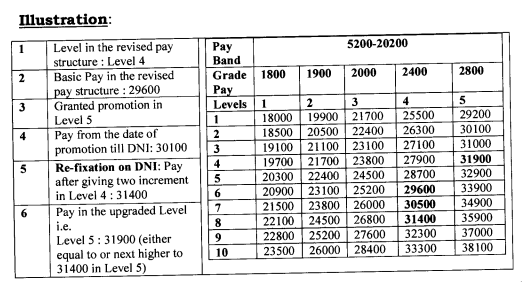 The issue of relevancy of provisions of FR 22(I)(a)(1) as well as the methodology of fixation of pay on promotion to a post carrying duties and responsibilities of greater importance, of a Government Servant in case he opts for pay fixation from the Date of Next Increment (DNI) has been considered in this Department. 2. 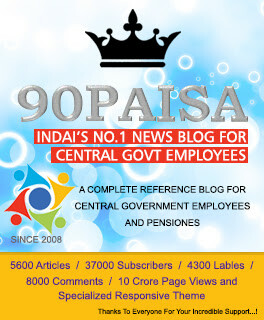 In this context, proviso under FR 22(I)(a)(1) inter-alia provides that the Government Servant (other than those appointed on deputation basis to ex-cadre post or on ad-hoc basis or on direct recruitment basis) shall have the option, to be exercised within one month from the date of promotion, to have the pay fixed under this rule from the date of such promotion or to have the pay fixed from the date of accrual of next increment in the scale of the pay in lower grade. (i) FR 22(I)(a)(1) holds good with regard to availability of option clause for pay fixation, to a Government Servant holding a post, other than a tenure post, in a substantive or temporary or officiating capacity, who is promoted or appointed in a substantive, temporary or officiating capacity, as the case may be, subject to the fulfilment of the eligibility conditions as prescribed in the relevant Recruitment Rules,to another post carrying duties or responsibilities of greater importance than those attaching to the post held by him/her. Such Government Servant may opt to have his/her pay fixed from the Date of his/her Next Increment (either 1st July or 1st January, as the case may be) accruing in the Level of the post from which he/she is promoted, except in cases of appointment on deputation basis to an ex-cadre post or on direct recruitment basis or appointment/promotion on ad-hoc basis. (ii) In case, consequent upon his/her promotion, the Government Servant opts to his/her pay fixed from the date of his/her next increment (either 1″ July or 1″January, as the case may be) in the Level of the post from which Government Servant is promoted, then, from the date of promotion till his/her DNI, the Government Servant shall be placed at the next higher cell in the level of the post to which he/she is promoted. (iii) Subsequently, on DNI in the level of the post to which Government Servant is promoted, his//her Pay will be re-fixed and two increments (one accrued on accoun tof annual increment and the second accrued on account of promotion) may be granted in the Level from which the Government Servant is promoted and he/she shall be placed, at a Cell equal to the figure so arrived, in the Level of the post to which he/she is promoted; and if no such Cell is available in the Level to which he/she is promoted, he/she shall be placed at the next higher Cell in that Level. (iv) In such cases where Government Servant opts to have his/her pay fixed from the date of his/her next increment in the Level of the post from which he/she is promoted, the next increment as well as Date of Next Increment (DNI) will be regulated accordingly. 4. It is further reiterated that in order to enable the officials to exercise the option within the time limit prescribed, the option clause for pay fixation on promotion with effect from date of promotion/DNI shall invariably be incorporated in the promotion/appointment order so that there are no cases of delay in exercising the options due to administrative lapse. 5. In so far as their application to the employees belonging to the Indian Audit and Accounts Department is concerned, these orders issue in consultation with the Comptroller &Auditor General of India. This calculator designed as per Concordance Tables. Concordance Tables for fixation of notional pay and pension / family pension of employees who retired/died in various grades during the 4th, 5th and 6th Pay Commission periods have been prepared and published by the Department of Pension & Pensioners’ Welfare on 6th July, 2017. Subject:- Payment on account of discontinued allowances – Regarding. The undersigned is directed to inform that the recommendations of the 7th CPC on allowances have been accepted by the Government with 34 modifications. Resolution in this regard has been published on 6th July, 2017. 2. In this regard, attention is drawn to Para 8.2.5 of the Report of the 7th CPC wherein it has been mentioned that any allowance, not mentioned in the Report (and hence not reported to the Commission), shall cease to exist immediately. In case there is any demand or requirement for continuation of an existing allowance which has not been deliberated upon or covered in this report, it should be re-notified by the Ministry concerned after obtaining due approval of Ministry of Finance and should be put in the public domain. 3. As the recommendations of the 7th CPC on allowances have come into effect from 1st July, 2017, disbursement of all existing allowances which have not been specifically recommended for continuation in terms of the Resolution dated 6th July, 2017 shall be discontinued from the salary of the month of July, 2017. 4. In view of the nature of the Allowances specific to Ministry of External Affairs, these allowances were not covered by the 7th Central Pay Commission. Hence this order will not be applicable to allowances specific to Ministry of External Affairs. 5. It shall be the responsibility of the Heads of the Department to ensure that no bills relating to disbursement in respect of such allowances is drawn by the Head of Office/Drawing Disbursing Officers under their purview/jurisdiction. Pay and Accounts Officers shall ensure that no payment is effected if any such bill relating to the disbursement of the discontinued allowances is submitted to them. If such bills are received, they should be returned to the DDO and intimation thereof shall also be given to the Head of the Department and the Chief Controller of Accounts. Now the Air Travel is allowed for Central Government employees those who are in Level 6 (Pre Revised Rs.4200 Grade Pay) and above. It is Good News for those who are in Level 6 to 8, as the Travel entitlement for them so far is AC II by Train only. Now the are entitled to Travel By Air in Economy Class. The 7th CPC has recommended that Travelling Allowances can be continued without any changes. But the Government has decided to extend the Air Travel Entitlement to Govt Servants those who are in Level As per the Gazette Notification issued by Government of India, the Travelling allowance is rationalised to enable the Central Staffs from Level 6 to 8 to Travel by Air . The Official concerned clarified that, this Modified Travel Entitlement will be extended to LTC also. According to the Gazette Notification issued by the Government on 6.7.2017, Junior Commissioned OFficers (JCOs) are now eligible to travel by Air. Those who are in Level 6 to 8 of Pay Matrix (Pre-Revised Grade Pay 4200, 4600 and 4800), as the Travel entitlement for them so far is AC II by Train only. Now the are entitled to Travel By Air in Economy Class. Level 6 to 8 pertain to the three ranks of JCOs — Naib Subedar, Subedar and Subedar Major — in the Army, and their equivalents in the Navy and Air Force. Level 5 A of Defence Forces to be clubbed with Level 6 for travelling entitlements. (ii) Specialist Medical Officers of Central Armed Police Forces and Assam Rifles of the Ministry of Home Affairs from 60 to 65 years. It would help in retention of officers in Specialist and General Duty Medical Cadre and thereby help in better patient care, proper academic activities in Medical colleges as also in effective implementation of National Health Programmes for delivery of health care services. Subject:- Modified Assured Career Progression Scheme for the Central Government Employees – Clarification regarding. The undersigned is directed to invite reference to the Para 4 of Annexure-I of the Modified Assured Career Progression Scheme issued vide the Department of Personnel and Training Office Memorandum No.35034/3/2008-Estt. (D) dated May 19, 2009 providing that benefit of pay fixation available at the time of regular promotion shall also be allowed at the time of financial upgradation under the Scheme. Therefore, the pay shall be raised by 3% of the total pay in the pay band and the grade pay drawn before such upgradation. There shall, however, be no further fixation of pay at the time of regular promotion if it is in the same grade pay as granted under MACPS. However, at the time of actual promotion if it happens to be in a post carrying higher grade pay than what is available under MACPS, no pay fixation would be available and only difference of grade pay would be made available. 2. 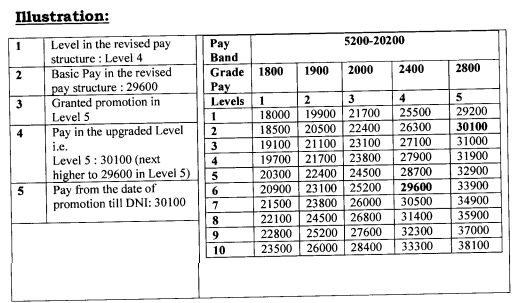 References have been received from various Ministries/Departments whether at the time of regular promotion/grant of Non-Functional scale, the employee may be allowed to draw the difference in Grade Pay after availing regular increment in the Pay Band and Grade Pay w.e.f. date of promotion or date of next increment consequent to MACP. 4. This modification in the MACP Scheme is being issued in consultation with the Department of Expenditure. 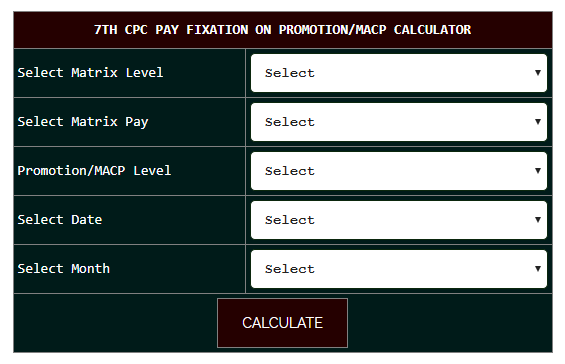 Pay Fixation on Promotion/MACP Calculator as per 7th Pay Commission with Steps showing in Pay Matrix Table. Pay Fixation: One increment shall be given in the same level and placed equal or next higher amount in the promoted level. Increment: Promotion/MACP during the period from 2nd day of January to 1st day of July will be granted on 1st day of January. From 2nd day of July to 1st day of January will be granted on 1st day of July. d) Follow up treatment from same specialist in non-empanelled hospital from where he/she was earlier taking treatment- as a special case in view of advanced age and to difficulty to change physician subject to the reimbursement limited to CGHS rates and collection of medicines as per CGHS guidelines. Consequent upon the decision taken by the Government on the recommendations of the Seventh Central Pay Commission, the President is pleased to decide that, Special Compensatory (Hill Area) Allowance stands abolished with effect from 1st July, 2017. This allowance was admissible to Central Government employees vide this Ministry’s O.M. No.4(2)/2008-E.II(B) dated 29th August, 2008. 2. These orders shall also apply to the civilian employees paid from the Defence Services Estimates. In respect of Armed Forces personnel and Railway employees, separate orders will be issued by the Ministry of Defence and Ministry of Railways, respectively. 3. In so far as the employees working in the Indian Audit and Accounts Department are concerned, these orders are issued with the concurrence of the Comptroller and Auditor General of India. With reference to the 6th CPC orders issued vide letter number 21(2)/2008-E.II (B) dated 28th August 2008 and7th CPC orders issued vide letter number No 21/5/2017-E(B) dated: 7th July 2017 issued by the Ministry of Finance, the Department of Expenditure. A analysis of comparison of the transport allowances of 6th CPC and 7th CPC was made, it is found that the Employees those who were in 1800 GP and 1900 GP as per 6th CPC and pay in the pay band equivalent to Rs.7440 and above are losing considerable amount on switching over to 7th CPC transport allowances , Hence the issue is being taken up by the Confederation. A study is made and computed as below. List of allowances recommended by the 7th Central Pay Commission along with modifications as approved by the Government of India. The revised rates of allowances shall be admissible with effect from the 1st July, 2017. We create a simple search box for all allowances with reference page of 7th CPC Report. Just type first letter of the allowance in the search box, select from the drop down list and get the details of the allowance for your reference. 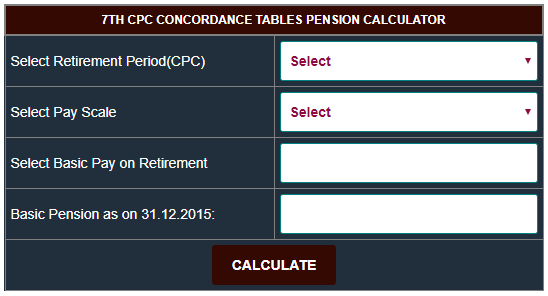 Revision of Pension / Family Pension with effect from 1.1.2016 in respect of Central Civil Pensioners / Family Pensioners who retired/died prior to 1.1.2016 by notionally fixing their pay in the pay matrix recommended by the ih Central Pay Commission in the level corresponding to the pay in the pay scale / pay band and grade pay at which they retired / died. It was provided that 50% of such notional pay shall be the revised pension and 30% of the notional pay shall be the revised family pension w.e.f. 1.1.2016.